I cannot remember an evening when my family did not sit down for a meal together when I was a child. I would have to say, 95% of the meals were home-cooked, with the additional 10% being Pizza-night or the occasional Chinese Food treat, but we always sat to eat as a family. The nutrients in a home-cooked meal are usually more substantial than take-out, but I’m happy to see that more healthy take-out options are emerging with our on-the-go culture. But still, you’re generally going to have more nutrients in a meal that you cook at home in comparison to most forms of take-out/ fast food. 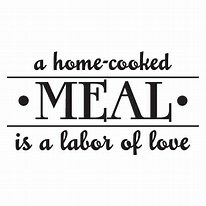 You’re also going to consume a lot less sodium, sugar, & unhealthy fats & fillers when you cook a meal at home. For many years, I worked very late for several nights per week, often missing dinner with my wife & children. I know it was necessary to work those late hours to accomplish what I wanted to accomplish. In recent years, I’ve made it a priority to have more home-cooked meals with my wife & children. There are still a couple of evenings that we’re scattered in different directions like work, sports, & activities, but we’re making a conscious effort to sit at the table as a family and eat a home-cooked meal. It’s also very nice to prepare and cook together, and I’m happy to see my daughters learning how to cook as well. I look back and appreciate that my family made that effort back then. It was a very good experience in our daily life. It was something that we took for granted at the time, because it just seemed like every family that you knew sat together for a home-cooked meal at that time. I feel that it is missing for many people in our present culture. Life is moving so quickly these days, and that little bit of time that was taken to enjoy the home-cooked meal was almost a cultural mechanism that slowed things down, even if it was just for a moment. It really was a labor of love that kept an important connection going in our lives. It wasn’t only the nutrition part of the meal, but the conversation, the structure, & the love of just being together. My Grandmother had passed away when I was was very young, so my Grandfather, who lived in the apartment below, had dinner with us most nights. On Sundays, we had dinner at my other Grandparents’ home, which was only a few blocks away. It was a comforting routine. Something about it brought you a sense of peace. Maybe we can all strive for more home-cooked meals in the following months. If anything, make the effort so that we can slow down the time in our fast paced lives. Fast food isn’t very good for you, & neither are these fast paced lives that we’re living. Health comes in many forms and from many different avenues, but a home-cooked meal is the junction of all the healthy aspects of life. Have a Happy Thanksgiving!!! Enjoy the time with family & friends. Pray for those who are unable to be with their families, & especially for our Armed Forces, our Police Officers, Fire Fighters, & Emergency Personnel who’s duty prevents them from being together with us. I thank God for all that we have, the roof over our heads, the food on our table, the clothes on our backs, for a loving family & friends, and for being born free and knowing freedom in our lifetime. Amen.